Our 1000W Air Mass LS-1000 Series Solar Simulators produce Class A Air Mass 0 and Air Mass 1.5 Emission Spectra to accurately replicate full spectrum sunlight, with 1 sun output intensity. They can also be quickly and easily configured by the user to provide UVA only, UVB only, UVA+B, Visible Only, or custom spectra optionally. Output beams are available in either round or square shape, with 2-6″ (5-15.25 cm) sizes. The LS1000-6S-AM Solar Simulator produces Class A Air Mass 0 and Air Mass 1.5 Emission Spectra to accurately replicate full spectrum sunlight, with 1 sun output intensity. It can also be quickly and easily configured by the user to provide UVA only, UVB only, UVA+B, Visible Only, or custom spectra optionally. With 98% uniformity available in the 6″ (15.25 cm) square beam’s central usable area, these precision research-grade instruments are specifically designed to comply with the latest laboratory standards such as ASTM, IEC, and ISO, and are relied upon by the most prestigious laboratories worldwide. 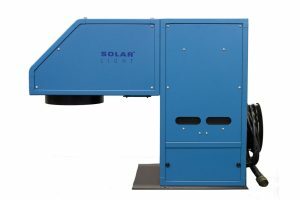 The LS1000-4S-AM Solar Simulator produces Class A Air Mass 0 and Air Mass 1.5 Emission Spectra to accurately replicate full spectrum sunlight, with 1 sun output intensity. It can also be quickly and easily configured by the user to provide UVA only, UVB only, UVA+B, Visible Only, or custom spectra optionally. With 98% uniformity available in the 4″ (10 cm) square beam’s central usable area, these precision research-grade instruments are specifically designed to comply with the latest laboratory standards such as ASTM, IEC, and ISO, and are relied upon by the most prestigious laboratories worldwide. The LS1000-2S-AM Solar Simulator produces Class A Air Mass 0 and Air Mass 1.5 Emission Spectra to accurately replicate full spectrum sunlight, with 1 sun output intensity. It can also be quickly and easily configured by the user to provide UVA only, UVB only, UVA+B, Visible Only, or custom spectra optionally. With 98% uniformity available in the 2″ (5 cm) square beam’s usable area, these precision research-grade instruments are specifically designed to comply with the latest laboratory standards such as ASTM, IEC, and ISO, and are relied upon by the most prestigious laboratories worldwide. The LS1000-6R-AM 1000W Solar Simulator produces solar UV radiation in the 290-400nm range, and can be quickly and easily configured by the user to provide UVA only, UVB only, UVA+B, or full spectrum sunlight optionally. With 98% uniformity available in the 6″ (15.25 cm) round beam’s usable area, these precision research-grade instruments are specifically designed to comply with the latest laboratory standards such as ASTM, IEC, and ISO. 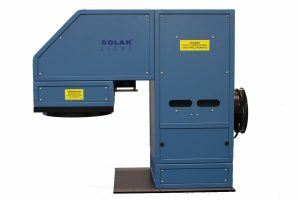 The LS1000-2R-AM Solar Simulator produces Class A Air Mass 0 and Air Mass 1.5 Emission Spectra to accurately replicate full spectrum sunlight, with 1 sun output intensity. It can also be quickly and easily configured by the user to provide UVA only, UVB only, UVA+B, Visible Only, or custom spectra optionally. With 98% uniformity available in the 2″ (5 cm) round beam’s usable area, these precision research-grade instruments are specifically designed to comply with the latest laboratory standards such as ASTM, IEC, and ISO, and are relied upon by the most prestigious laboratories worldwide.